For someone who has been overseeing Europe’s largest infrastructure project for the past decade, Julian Robinson still has an eye for detail. During FX’s tour of the London Transport Museum’s Crossrail exhibition he pointed fondly to a smart new clock in Transport for London’s blue, and with the New Johnston font. The intention is to attach it to the walls of some of Crossrail’s ticket halls and platforms. And although its exact destinations are yet to be resolved, Robinson was already picturing it beyond a railway setting. ‘I would like to see it as a watch sold in shops,’ he says. But of course, most of the complexities of Crossrail have already been sorted out. ‘Now, we are conducting, rather than dictating, the minutiae,’ says Robinson, Crossrail’s head of architecture. Because, if Londoners hadn’t realised, Crossrail Limited’s new £14.8bn railway for London and the South East is nearing completion. When it opens in December, it will be known as the Elizabeth line and will run from Reading and Heathrow in the west, through 42km of new tunnels under London to Shenfield and Abbey Wood in the east. To this end, 10 new stations are being built and 30 more upgraded, and new and existing infrastructure is being integrated. This is Robinson’s most recent stint on the line. He worked on it in the early Nineties until the Bill failed in parliament, and came back as a consultant in the early 2000s. Robinson’s team wrote the contracts for the current design, and selected firms for its roster, which then tendered for each of the design contracts (they were not asked to do a design). Although some firms – Wilkinson Eyre, Weston Williamson and Hawkins\Brown – have been involved with Crossrail for a decade or more, all were appointed at pretty much the same time, meaning everything was running in parallel. At the same time, the in-house team was managing timescales, and dealing with the urban environment and local authorities. All this while, considering the passenger experience: should it be line-wide, end-to-end design or more localised? ‘We wanted it to be end to end, but how that manifests itself has to be a bit flexible,’ says Robinson. And at a micro scale, there was to be a localised design approach, to allow the buildings to ‘knit into the environment’, he adds. To get the design teams to mold their ideas to a common direction, Crossrail held meetings for all architects to ‘show us your wares’, where work was pinned up for everyone to see what each other was doing. Nor did Robinson want ‘a big tide mark’ between the C100 group’s common parts and the architects’ work above (generally the ticket halls are at surface level, to make as much use of daylight as possible – a decision that was made in the early Nineties.) This has been avoided through a consistency of materials – concrete, terrazzo flooring, natural stone, stainless steel, glass – and a minimum use of coated or painted finishes, to give robustness and clarity. While there is consistency at platform level, the stations’ buildings and exterior spaces are intended to reflect the local area. So Paddington’s design by Weston Williamson is entwined with its Grade I listed structure. ‘It won’t slap the general public in the face, but they’ll start to appreciate it,’ says Bee. This is the first time in a major UK rail project that the stations, surrounding areas, and even the oversite developments have been designed concurrently. ‘We hope that this is part of the legacy for Crossrail, for TfL to adopt for CR2,’ says Robinson. The intention is for these buildings to last for 120 years. Bee at WW calls them ‘major public buildings for the nation. They are cathedrals of the modern age,’ he says. In which case, come December, passengers will be Crossrail’s new congregation. This station, in one of the capital’s more deprived outer-London districts, is part-funded through £20m from Berkeley Homes, which is building hundreds of units nearby. Only Woolwich and Canary Wharf have private funding. Woolwich is an excavated ‘box’ station, with an island platform and a single entrance at the western end of the 276m-long box. This opens on to Dial Arch Square, a green space, flanked with Grade I and II listed buildings, and leads to the town centre. Meanwhile, the external facades of the ticket hall feature graphics from the ‘Dead Man’s Penny’, a bronze memorial plaque forged at the arsenal after the First World War. More than a million were made on the site, and given to the families of all service personnel who died in the war. On a drizzly day in July, a dozen or so workmen in PPE (personal protective equipment) made their way down London’s second longest escalator with a ribbon of black rubber slung over their shoulders. They were fitting a handrail at Tottenham Court Road’s new Dean Street station. Up at ticket hall level, a third of the drum lights had been installed in the ceiling, though the ticket gates were yet to arrive. The station was 82 per cent complete more than a year before its opening this December. 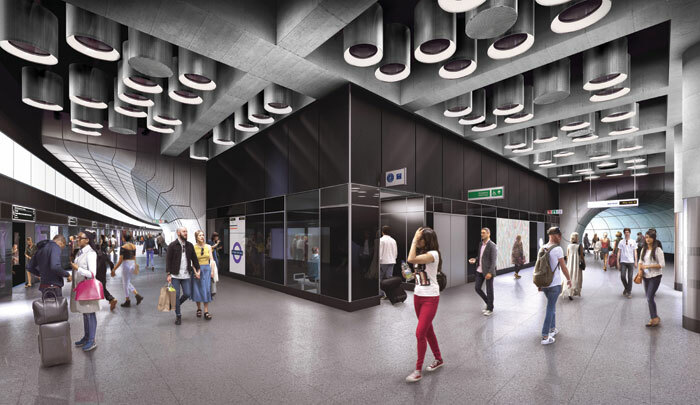 The £1bn new station and upgrade of the existing station will make Tottenham Court Road one of London’s busiest stations, with 200,000 passengers a day. TCR is one of Crossrail’s five mined underground stations in central London — the others are Bond Street, Farringdon, Liverpool Street and Whitechapel. 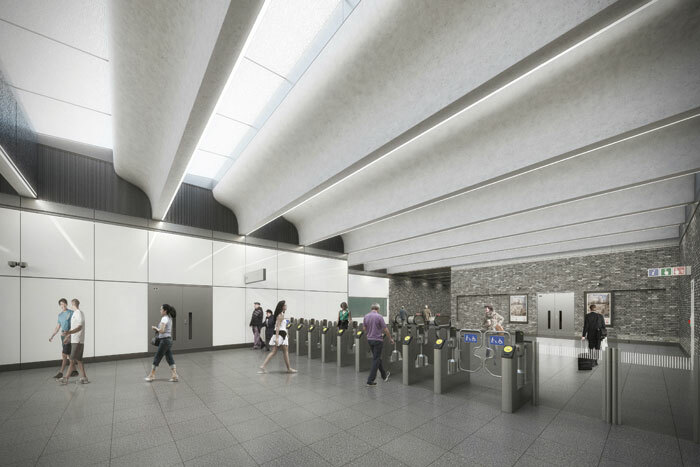 While the Dean Street ticket hall is in black glass and stainless steel, the Crossrail upgrade for the existing TCR station – beneath St Giles Circus – is in white glass. The former has a reference to the grid of Georgian streets on one wall, while the light drums are a nod to the people moving through the streets of Soho. 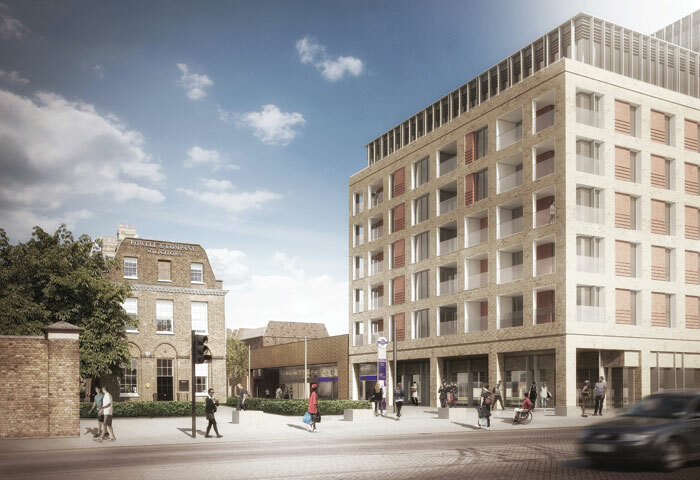 Westminster Council was a key stakeholder in the project. Because two Georgian blocks had to be demolished to make way for the Dean Street station, ‘the council wanted us to recreate a series of Georgian townhouses,’ explains Birdi. Hence the precast panels of brickwork for the next-door substation, which echoes the brickwork of neighbouring buildings. And pedestrians passing along the street will also see these buildings reflected in the station’s two fully-glazed walls. Inside the station, artist Richard Wright will apply gold-leaf artwork to the ceiling of one of the eastern escalator boxes, and screens will display digital artworks by Douglas Gordon. On FX’s visit to the platform at Tottenham Court Road’s new Dean Street station in the summer, the tracks are down, as was the support structure for the screen doors. The space felt generous for a subterranean line, but of course, this isn’t the Tube. Instead, the size of tunnels is dictated by Crossrail’s full-size surface trains, which, in turn, inform the passenger tunnels. The design of Crossrail’s common parts has been carried out by C100, a consortium comprising Grimshaw Architects, Maynard Design, GIA Equation and Atkins. The intention was to create consistent design language that would aid accessibility for passengers and help with the maintenance of components. C100’s efforts included tunnel cladding and flooring, wayfinding, graphics and signage, platform screen doors and platform edge screens, lighting and integrated service booms, balustrades and handrails, and technology components. 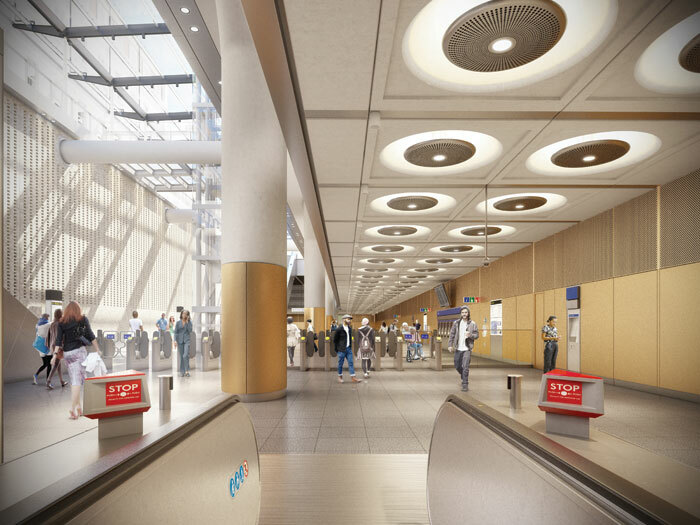 In underground spaces, from station platforms to the top of the escalators, the architectural forms and materials will be recognisably consistent, to give passengers a sense of familiarity right across the route. One of the starting points of the concept was to express the engineering and the tunnels in the cladding and lining, according to Graham Gibbon, associate at Grimshaw. So, the rough lining is sprayed concrete, which results in curved, as opposed to right-angled, junctions. ‘We wanted to follow those curves to give greater sightlines,’ he says. On to the lining are attached panels of glass-fibre-reinforced concrete, because it ‘reflects light, is self-finished, and wears and ages in a forgiving manner’, Gibbon adds. Meanwhile, the consortium came up with a number of ways to ease maintenance. All the lighting for the escalator areas is embedded in the escalator deck itself, so there is no need for scaffolding or access equipment to get to high ceiling lights. On the platforms, a full-height screen (with doors in the lower part) separates the platforms from the track. All the services – the speakers, projecting signs, cameras and service cables – are gravitated to above the door screens, giving the cladding clean lines. And the totems at platform level house lighting, PA and CCTV systems and signage. ‘The totem is effectively a cabinet with doors on either side, so there is no need to bring in any specialist equipment,’ Gibbon says. Different lighting levels and colour temperatures help intuitive way finding for passengers in and out of the station. As passengers come up to the surface, these common components peter out, a process that was developed with each of the stations’ designers.